Walter Stahr, author of a new biography on one of America’s greatest statesmen, William Henry Seward, will be visiting Florida, NY (Orange County) on October 14. The visit will include a lecture and book signing at the school founded by William Henry’s father, Samuel Sweezy Seward, which today still bears his name, the SS Seward Institute. This will be Stahr’s third visit to Florida. His first two visits took place while he was researching his latest book, Seward: Lincoln’s Indispensable Man, which took four years to complete. The biography, released in September, has already received highly favorable reviews. William Henry Seward was New York State Senator, Governor of New York, United States Senator, Secretary of State under Presidents Abraham Lincoln and Andrew Johnson, and the person responsible for the purchase of Alaska (&#8220Seward’s Folly&#8221). He was born in Florida, NY on May 16, 1801. 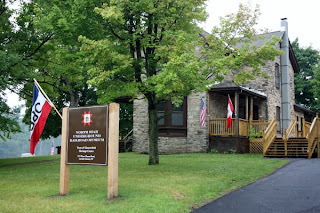 Ownership of Seward’s birthplace, located at 35 North Main Street was transferred to the Village of Florida in March 2010, after it was purchased by the Town of Warwick through community preservation funds. The house that saw the birth of William Henry has a rich and colorful history. After Samuel Seward moved his family into a larger home, the house, built in 1797, is thought to have been used as a tavern and then a general store. Samuel later sold the house to William E Mapes, who was among the first to respond to President Lincoln’s call for 300,000 three years men, marching with the 124th New York Volunteers (the Orange Blossoms) as they left for war on September 6, 1862. In turn, William sold the house to his brother, Mortimer Mapes, who had it dismantled and moved to make room for a larger home for the Mapes family. The Queen Anne-style &#8220Mapes House&#8221 built in 1887 remains, in much disrepair, on the site of the original Seward house. The original house, meanwhile, was reassembled elsewhere on the property. It was subsequently used as a carriage house, boasted an early indoor plumbing system, and, under later owners who turned the Mapes House into a funeral home, was used as an embalming room. It currently exists as a barn. A separate kitchen wing, perhaps where the young William Henry sought refuge from the &#8220strict decorum&#8221 of his father’s parlor, also still exists. The long-neglected property—once littered with debris and dilapidated buildings—is being transformed by a dedicated group of volunteers who have already made great strides to see that it becomes a fitting monument to the legacy of William Henry Seward. The Mapes House/Seward Homestead, as the property is now known, has been listed on the New York State Register of Historic Places and a $400,000 grant secured for restoration efforts. Stahr’s visit is being organized by Seward Homestead, Inc., a New York State not-for-profit corporation formed to help secure funds for renovation and future preservation of the property, in collaboration with the Florida Union Free School District. The lecture will start at 1 PM and be followed by the book signing at the SS Seward Institute, located at 53 North Main St., Florida, NY 10921. Copies of &#8220Seward: Lincoln’s Indispensable Man&#8221 will be available for purchase at the event or may be pre-purchased for a 10% discount. For more information visit www.SewardHomestead.org.